Figure 1. 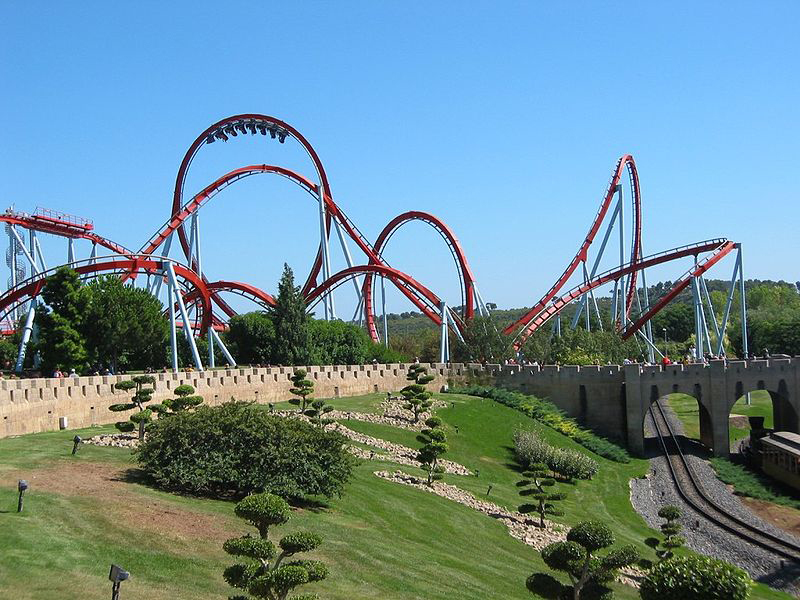 Everyday motion that we experience is, thankfully, rarely as tortuous as a rollercoaster ride like this—the Dragon Khan in Spain’s Universal Port Aventura Amusement Park. However, most motion is in curved, rather than straight-line, paths. Motion along a curved path is two- or three-dimensional motion, and can be described in a similar fashion to one-dimensional motion. (credit: Boris23/Wikimedia Commons). The arc of a basketball, the orbit of a satellite, a bicycle rounding a curve, a swimmer diving into a pool, blood gushing out of a wound, and a puppy chasing its tail are but a few examples of motions along curved paths. In fact, most motions in nature follow curved paths rather than straight lines. Motion along a curved path on a flat surface or a plane (such as that of a ball on a pool table or a skater on an ice rink) is two-dimensional, and thus described by two-dimensional kinematics. Motion not confined to a plane, such as a car following a winding mountain road, is described by three-dimensional kinematics. Both two- and three-dimensional kinematics are simple extensions of the one-dimensional kinematics developed for straight-line motion in the previous chapter. This simple extension will allow us to apply physics to many more situations, and it will also yield unexpected insights about nature. 3.0 Introduction by OpenStax is licensed under a Creative Commons Attribution 4.0 International License, except where otherwise noted.